Raised Toilet Seats. Toilet Seat risers can add 3" to 5" of lift to your toilet making it easier to get on and off the toilet. Choose from round or elongated to standard or padded raised toilet seats. We feature elevated toilet seat risers and under seat risers. Raised toilet seats are a great option for people recovering from hip or knee surgery and individuals that have difficulty getting on and off the toilet because of the toilet being too low. Our raised toilet seats are available with or without handles or arms. 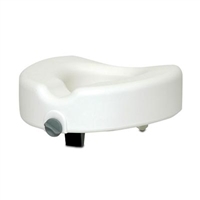 Locking Raised Toilet Seat - The ProBasics Clamp-On Toilet Seat from Invacare aids in making toileting more stable and comfortable for users. The clamp-on toilet riser mechanism prevents shifting when the user is transferring to and from the toilet seat for added peace-of-mind. Always make sure that the Clamp-On Toilet Seat is securely in place and stable before each use. Although the Clamp-On Toilet Seat is designed for use on most popular toilets, it may not work on certain unusual, elongated or artistic bowls. Works on MOST round or elongated toilets. How do I chose the right elevated toilet seat? There are a few considerations to determine which raised toilet seat is right for you. First determine the appropriate elevation needed. If you have a chair or stool that is comfortable and easy to get out of measure that and subtract the height of the toilet. Most raised toilet seats measure 3"-5" in elevation height although there are some that can go higher or a little lower. Next determine the toilet shape. Is it round or elongated? For many of the raised toilet seats it doesn't matter be there are a few that it must be specified. Many of our raised toilet seats have the option to have handles built in, this is a plus if you need a little extra help getting up from the toilet. You can also add a toilet safety frame and use it in addition to your raised toilet seat, some people find this route a little more secure. Another option to raise the height of the toilet is to use a commode over the toilet with a splash guard.